Yes, we are a few weeks past the actual solstice, but it certainly, undeniably winter, and so it's time again for Poets, Writers, Musicians Against the War on the Earth to meet again. At summer solstice, 350 people gathered at St. Joan of Arc Church and the event spilled out into the summer evening. 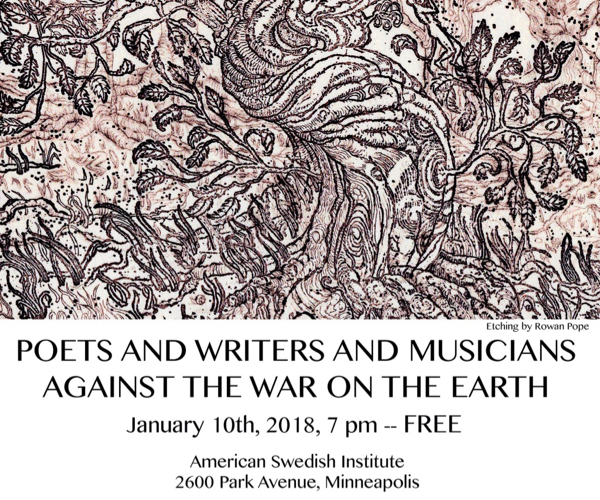 This time the family-friendly event of readings, music and hot cider will take place at the American Swedish Institute, free for everyone. Going outside will be optional. The event begins at 7 p.m. on Jan. 10, co-sponsored by Rain Taxi Review. Writers to read will include Sharon Chmielarz, Jim Heynen, Ezra Hyland, Athena Kildegaard, Danny Klecko, Ardie Medina, Matt Rasmussen, Katherine Rauk, Thomas R. Smith, Barton Sutter and Tim Young. Music will be by the Frantzich family, and singer Prudence Johnson. The event is meant to celebrate the seasons and the solstice, and also to raise awareness of climate change. Representatives of Citizen’s Climate Lobby, Climate Generation, Cool Planet, Minnesota Interfaith Power and Light, and mn350.org will be on hand. The group was inspired by Robert Bly's 1960s organization, Poets and Writers Against the Vietnam War. Organizers include Bly's wife, Ruth; poet James Lenfestey; and poet and writer Freya Manfred. Come on down, they urge, and sing and speak for the cause of preserving Mother Earth.